La Branchaie offers two bedrooms including a private entrance and garden view. Free private parking is available. The property also has free WiFi. There is a bus which stops in front of the house that goes into the center of Gembloux. Both rooms have a private bathroom fitting a shower or bath and a private toilet. Other amenities include a flat-screen cable TV and a desk. The buffet breakfast is served each morning in the breakfast room. In the surroundings there are numerous cafes and restaurants that serve Belgian and international cuisine. 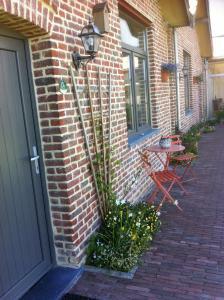 The B&B La Branchaie is situated at the intersection of the N4 and N25, and the E411 motorway close to the center of Belgium. Namur is situated 30 km from the accommodation. Brussels (42 km), Mons (73 km) and Liège (80 km) are within driving distance. The Dutch city of Maastricht (108 km) is located a little over an hour away. The airport of Brussels South Charleroi is 20 km from the property.